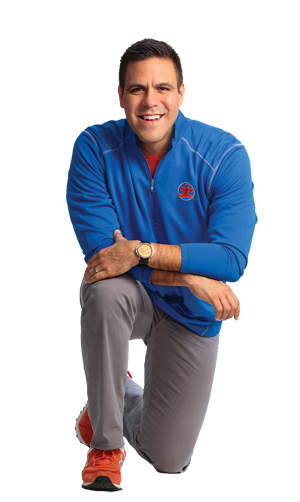 David Geslak, “Coach Dave,” began teaching exercise to children with autism and other cognitive disabilities in 2004. At the time, exercise wasn’t listed as a form of treatment, which inspired Dave to change this paradigm. As he was witnessing both physical and emotional breakthroughs, Dave made it his mission to reach more children, adults and professionals. Dave soon began creating functional exercise resources, DVDs, books, and the created the Visual Exercise System to empower other parents and professionals to make a difference. This did not go unnoticed. In 2012, The Autism Channel offered Dave a TV Show, “Coach Dave,” allowing him to reach both a national and international audience. In 2013, Jessica Kingsley Publishers published his book, The AutismFitness Handbook. In 2015 he collaborated with the National Center on Health, Physical Activity and Disability (NCHPAD) to create an autism exercise video series. Also in 2015, Coach Dave launched ExerciseBuddy, an App that engages and communicates to those with autism when introducing exercise. Nine universities have now adopted ExerciseBuddy into their programs. Coach Dave is widely recognized for his affection to the community, his dynamic presentations and for the pioneering of structured visual exercise programs. He has trained professionals and parents around the world, including, Egypt, Dubai, Barbados, Russia and Canada. The autism and special needs community have embraced Dave’s message and are especially encouraged by his results. David Geslak has a Bachelors Degree in Health Promotion from the University of Iowa, is a Certified Exercise Physiologist with the American College of Sports Medicine (ACSM), and a Certified Strength and Conditioning Specialist with the National Strength and Conditioning Association (NSCA). He is a former Fitness Coordinator at a school for children with autism, as well as, a para-educator. Prior to working in the autism community he was an Assistant Strength and Conditioning Coach for the University of Iowa Football Program. Learn more about the Exercise Connection at their website, exerciseconnection.com.